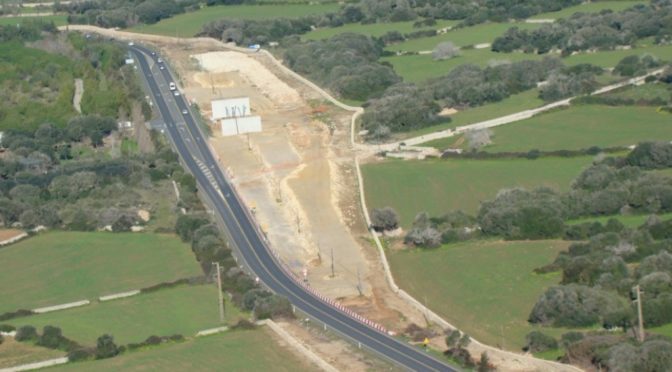 Another controversy regarding the works on the main road of Menorca. The action for information that GOB organised on Friday 9 February outside the offices of the Consell Insular (the island governing council) raised some dust and brought up some questions. The event, as was explained previously, had three basic objects. In the first place, to publicise the payment of the legal costs to the Consell Insular and to thank all those concerned for the magnificent public response in raising the funds. In the second place to ask the government for a timetable of the works to be carried out on the section of the road between Mahon and Alaior. And, lastly, to make public some information relating to the payments made for the works. This last question has obtained the most attraction by the media, because the Partido Popular (PP) and its usual spokespersons replied energetically as they saw their management of the road, when they were in power, put into question. Let us start on this topic. During the legal proceedings, which had to be made for adjusting the costs of the precautionary measure of bringing the work to a standstill; payments made by the Consell (available on the internet on the Consell’s website) with reference to the work were looked at, as were the invoices issued. GOB´s attention was brought to some of these things and it was considered a moral obligation to tell people how much had been mobilized for these works. What was surprising was that nearly 26,000 euros had been paid for a prosecuting lawyer. This amount is much greater than normal rates. And another surprise was that a judge (a judge, not GOB) had said that the Consell did not need to contract these services. Surprising, also, that they contracted two expensive lawyers (30,000 euros) and the College of Balearic Lawyers, whose opinion was requested by the judge, considered their costs to be excessive for the work on the precautionary measures. A total of 56,800 euros in legal costs. GOB paid 9,075 euros with respect to costs. Another surprising point is that the company that appointed the construction company bidding for the work was the same company that then awarded the management of the works. And that the prosecuting lawyer mentioned above appeared as the deputy administrator of this company. Before all this information came to light PP had reacted threateningly by quarrelling with GOB accusing our association of being politically partisan. But GOB had done nothing except to announce the information contained in the dossier which then resulted in legal proceedings. The environment ought not to be a subject belonging either to the right or the left. And in this sense, it would be very good that the PPr revise its relationship with environmental matters, as many European conservative parties have been doing for some years. To the north of Europe, there are human rights people who join together to fight against poisons, against the destruction of ecosystems, against the overexploitation of some resources… Angela Merkel has a conservative profile and her government has promoted alternative energies in a very positive way. They do not invest in large roads nor in huge airports. And the economy is rather better than here.